Sugar Bear Hair Vitamins - Secret To A Healthy Hair? Are Sugar Bear Hair Gummies Vegan? Can You Take Sugar Bear Hair Vitamins While Pregnant? Is Sugar Bear Hair FDA Approved? What Does SugarBearHair Do To Your Hair? If you spend any significant amount of time on social media sites such as Twitter, Facebook, or Instagram, you’ve undoubtedly seen the thousands of people all around the world raving about the cute bear-shaped blue gummy called SugarBearHair Vitamins. Formulated to help improve and strengthen your hair, SugarBearHair is quickly making bad hair days a thing of the past. A vegetarian gummy supplement, SugarBearHair is packed with a wide variety of vitamins and minerals that have been known to promote healthy hair. The unique SugarBearHair formula includes folic acid, biotin, and Vitamin D, all of which are essential in having healthy and vibrant hair. By taking just two gummy bears a day, within as little as three months, you’ll begin to notice a difference in the shine and feel of your hair. Unlike some other hair supplements that are outrageously expensive and taste bad, SugarBearHair gummies are both affordable and delicious! Best yet, the SugarBearHair gummies are designed to play nice with your stomach and don’t leave any nasty side effects when taken. If you’re looking to improve the quality of your hair or need a vitamin to help promote overall good hair health, SugarBearHair vitamins have you covered. Lock in your vitamins with a single purchase or sign up for a monthly subscription for a generous discount. Omega-3, Vitamins B-12, C, D-2, E.
16 Micronutrients To Help Supplement Missing Vitamins. As the name suggests this version of the gummies is vegan. What makes the SugarBearHair Women’s Vegan Multivitamin so special is that they not only improve the health of your hair, nail, and skin but also come with six key nutrients that help support high energy levels throughout the day. Taken with the original SugarBearHair vitamins, you’re not only improving the quality and health of your hair, this multivitamin helps provide your body with the additional nutrients it needs to handle the stress of everyday life. SugarBearHair Women’s Vegan Multivitamin is formulated with the perfect doses of Vitamins B-12, C, D-2, E, and Omega-3. Additionally, this high-quality multivitamin includes 16 extra micronutrients that many women do not get enough of in their regular diet. Because the vitamin blend is vegan, the amino acids found in the multivitamin are believed to aid in collagen production, which of course has been suggested to improve the health of your hair, skin, and nails! 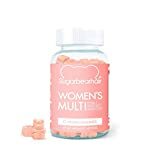 One of the best parts about the SugarbearHair Women’s Vegan Multivitamin is that it tastes good! Some other multivitamins on the market claim to have a high concentration of vitamins but they are nearly impossible to consume. Not only do SugarBearHair’s vitamins not taste bad, they actually taste delicious! If you’ve struggled to get in the habit of taking your multivitamin before, there’s nothing on the market that tastes as good as this. To top it off, the multivitamin uses absolutely no artificial flavors, so the amazing taste comes naturally from the vitamin blend and not any additional harmful chemicals or flavors. If you need that extra edge to help get you through the day, you can’t go wrong with the Women’s Multi (that’s what they call it) and the SugarBearHair vitamins. It is, however, important to note, the Food and Drug Administration has not evaluated these gummies. One of SugarBear’s newest products, SugarBear Sleep, is designed to improve the quality of your shut-eye so you can wake up rested and full of energy. These gummy bears are soy-free, vegan, cruelty-free, gluten-free and will help you drift into hibernation quickly. SugarBear Sleep is loaded with a wide variety of vitamins and minerals known to promote restful and quality sleep and help you wind down after an incredibly busy and sometimes stressful day. Among the ingredients, you can find valerian root also known as nature’s valium, melatonin, and magnesium. SugarBear Sleep also contains Vitamin B6 which is known to help your body naturally increase its melatonin production which further enhances the quality of your sleep. In addition, lemon balm leaf helps produce a calming effect that can reduce restlessness, and passion flower works to calm brain activity before bed. Best of all, the ingredients used in SugarBear Sleep won’t cause any dependency issues that other sleep aids are known to do. This all-natural formula will help you get to sleep quickly and stay sound asleep throughout the entire night. The original SugarBearHair Vitamins are not vegan, but they are both vegetarian and cruelty-free, meaning no animals are harmed throughout the process of creating the vitamins. Additionally, SugarBearHair vitamins are also gluten-free and gelatin-free and are made with real berries, coconut oil, and a pinch of sweet flavoring to give the vitamins that irresistible taste. SugarBearHair vitamins also contain no hormones and are dairy free. If you are looking for a vegan vitamin option, SugarBear Sleep Vitamins are certified vegan. SugarBearHair vitamins use only the finest quality ingredients each of which is optimized to ensure effective consumption and deliver fast results. While any company can make outlandish claims about the effectiveness of their products, very few companies have the results to show that SugarBearHair does. With thousands of happy customers all around the world and a 4.8 out of 5 average rating, it’s clear they are on to something. According to a survey, over 99 percent of SugarBearHair customers prefer the taste of SugarBearHair compared to other vitamins. Additionally, over 93 percent of customers began seeing results in their hair, skin, and sleep in less than three months. Many women are tired of investing in product after product to help improve their hair, skin, and nails only to be disappointed again and again. SugarBearHair care gummies provide 167x your daily doses of biotin, vitamin B and H, as well as provide pretty much the whole amount of B12 that your body needs. It has been proven that the lack of any of these vitamins can negatively impact the health of your hair and nails, which is why so many SugarBearHair customers see results so quickly. SugarBearHair vitamins are optimally dosed to provide the exact amount of nutrients your body needs to promote healthier hair and skin naturally. Because many women are deficient in a wide variety of essential vitamins, SugarBearHair works to bridge the gap where women aren’t getting the vitamins and nutrients they need. While many customers will begin to see and notice results right away, SugarBearHair recommends consuming their vitamin products for at least three months before deciding whether they are right for you. For a small one-time investment, you could easily be well on your way to improved hair, skin, and nails. However, despite such glowing reviews, no supplement affects every user the same. The answer here is more SugarBearHair should work to improve the condition of your hair based on the ingredients—whether they will work for you remains to be seen. While SugarBearHair products are free of any side effects, and no ingredients in SugarBearHair products are known to cause problems during pregnancy, it is always recommended to speak to your health care professional if you are pregnant, nursing, or expecting to become pregnant before consuming any new supplements, including those offered by SugarBearHair. While the Food and Drug Administration has not evaluated SugarBearHair products, the ingredients used in their suite of vitamin products have been shown to help promote overall good health in a wide variety of clinically based studies. SugarBearHair products are not designed to prevent, cure, or diagnose any health-related issue or disease. Please speak with your certified health professional before taking SugarBearHair products. These berry-flavored beauty supplements are filled with 13 vitamins and minerals that help leave your hair shiny, full, and promote its growth, meanwhile making your nails look and feel strong and healthy looking. Just chew two gummies a day for 60 days for maximum results and your hair might become shinier, fuller, longer, with no sight of hair breakage or hair shedding. Improved mood and an overall sense of wellbeing. Over time as your body continues to get the vitamins and nutrients, it needs for optimal health, SugarBearHair users tend to see a variety of additional benefits aside from more vibrant hair. While no single vitamin or SugarBear product is a substitute for a healthy diet and exercise, for those who are looking to maximize their energy and health levels, SugarBear vitamins can help make a huge difference in how you feel throughout the day. If you’re tired of your hair looking flat or of your hair breaking, give SugarBearHair vitamins a try and see why thousands of women all around the world are falling in love with these incredibly tasty vitamins.